Business premises on London Road, vacant and boarded up as of March 2019. See the Past and Present of Croydon's London Road for history up to September 2017, at which point the premises were vacant. It was still vacant as of November 2017, but signage had appeared for a clothes shop called Divine Boutique photo. However, by June 2018 this signage had vanished again (we never actually saw Divine Boutique open) and there seemed to be shopfitting work going on inside. By July 2018 it was operating as a hairdresser photo of board outside, though the old Broadway 4 signage was still up photo. 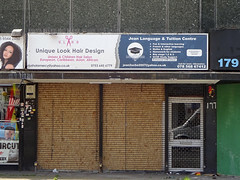 By October 2018 it had acquired signage for Unique Look Hair Design photo, but by March 2019 it had closed down again and the premises were boarded up photo. Last edited 2019-03-29 13:35:09 (version 50; diff). List all versions. Page last edited 2019-03-29 13:35:09 (version 50).